Welcome to July’s Stamp ‘N Hop! 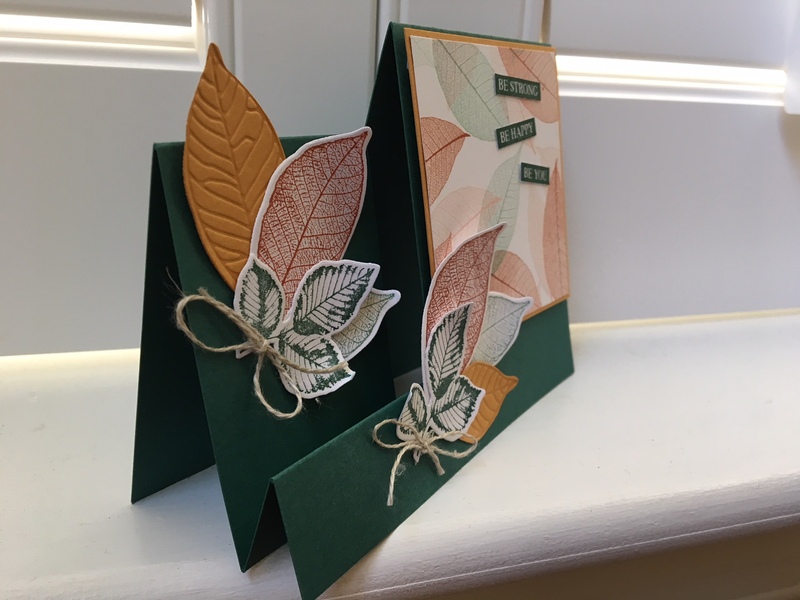 We are a group of global stampaholics who love sharing ideas for cards and other stamping projects. 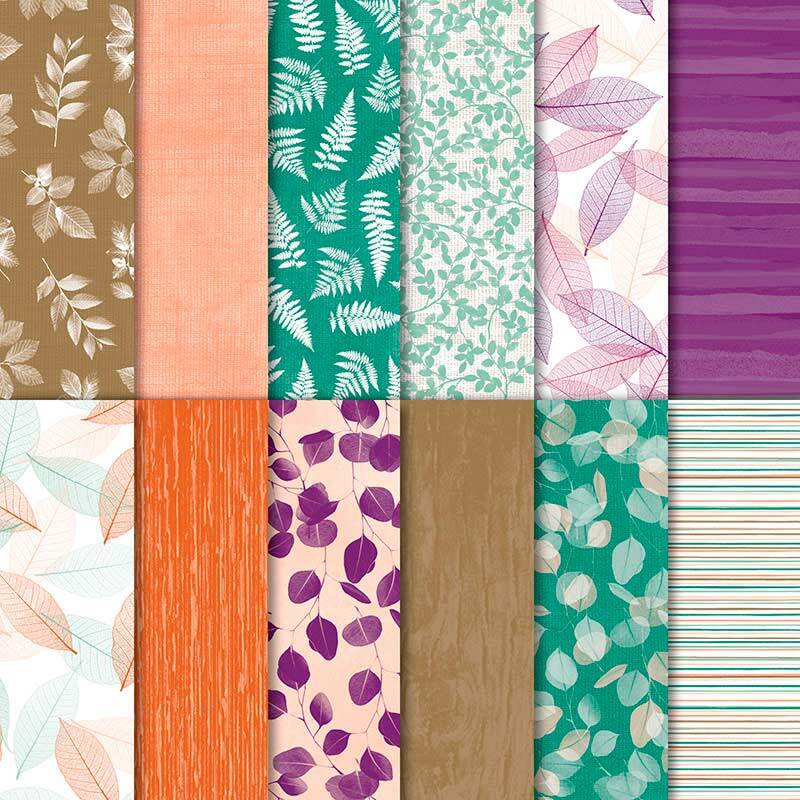 This month, our projects feature our favorite new Designer Series Paper (DSP) collections from Stampin’ Up!’s new annual catalog. Since there are many gorgeous DSP collections, I am sure everyone in the hop had difficulty picking the favorites. I know I sure did!! If you just came from Terry’s post, I’m sure you’ll agree that she is an amazing artist and had a great project to share. Thanks so much for stopping by to see my post. 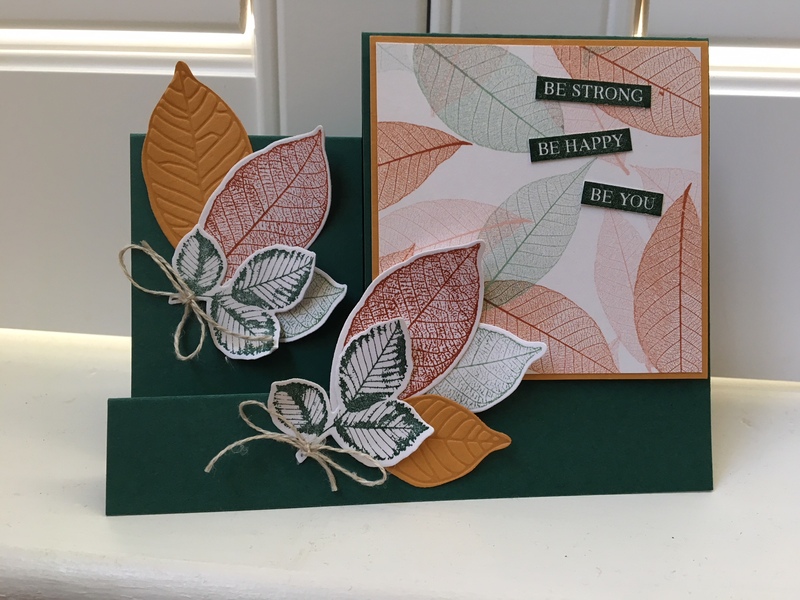 I hope I can give you some inspiration and tips for making a fun, step card that features the fabulous new Nature’s Poem DSP collection. This collection of DSP is pictured below. It is perfect to use for both feminine and masculine cards, and it has a wide range of gorgeous colors in the designs. And, best of all, the collection is one of ten DSP collections that are on sale this month only as a buy three and get one free deal. Click here for more information! Okay… now onto the card. Usually, I use DSP as a background to a card. But, when I saw the Nature’s Poem collection, I decided that the DSP really should be the focal point of the card. A single side-step card seemed the perfect way to highlight the DSP design. Below are a few pictures of the card. 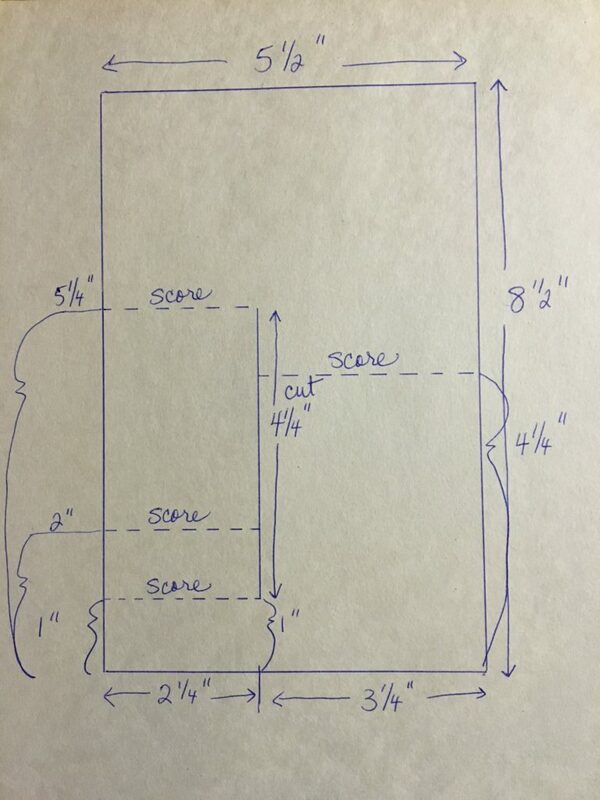 If you’ve never made a step card, trust me it’s a lot easier than you may think. Use the rather rough diagram below as your guide to the pattern. Please also check back on my blog. I’ll have more detailed step-by-step instructions posted in a few days. The card base is a piece of Tranquil Tide cardstock. 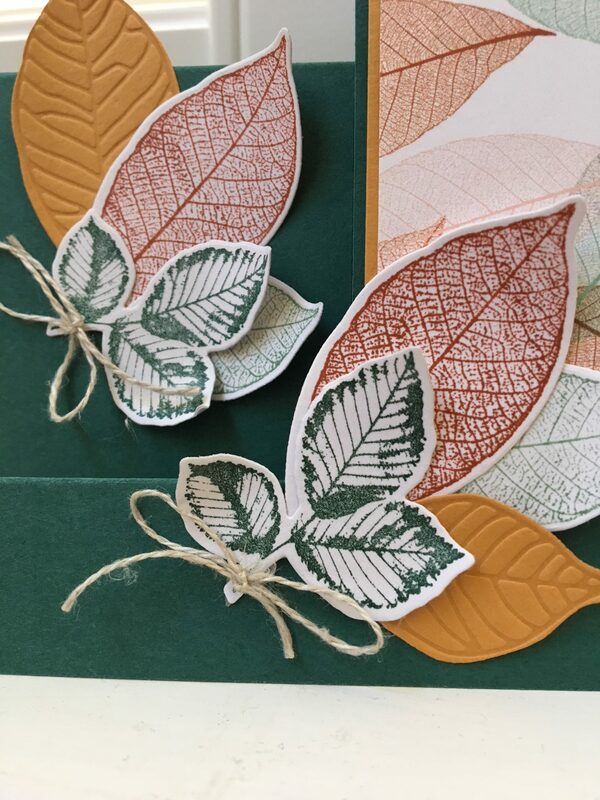 The leaves are stamped using the Rooted in Nature stamp set. The corresponding Nature’s Roots Framelits Dies were used to die cut the leaves. The stamp set and dies are available in a bundle. By the way, there are awesome embossing dies in the die set. 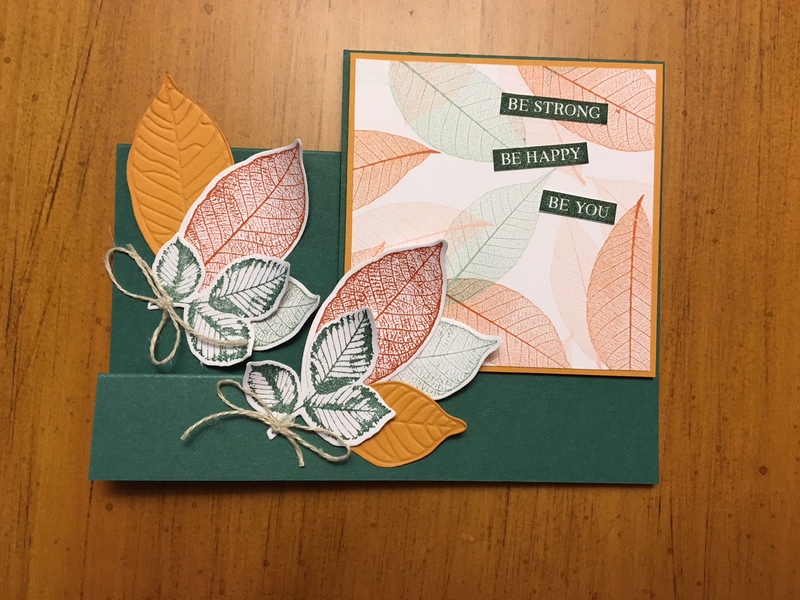 Take a close look at the leaves made with Mango Melody cardstock. 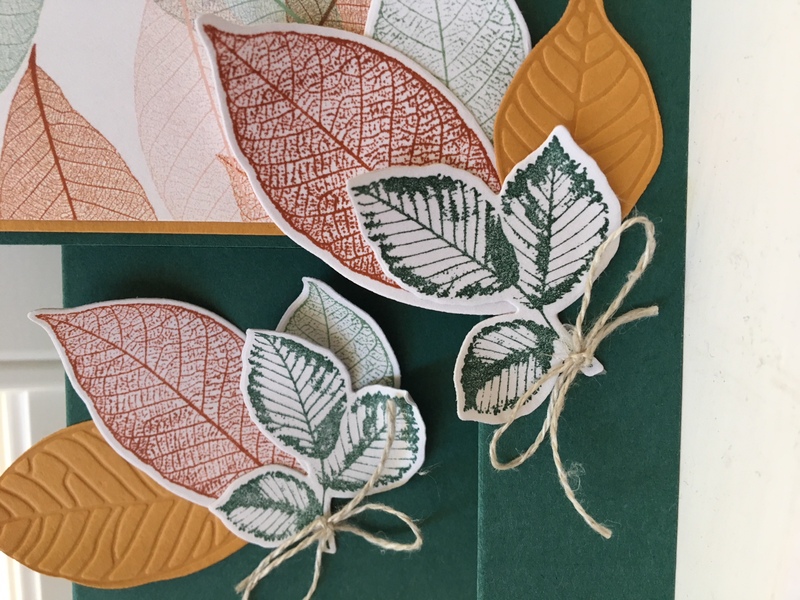 They have a fantastic leaf pattern that was created with the embossing dies. The inks used for the card include Tranquil Tide, Cajun Craze, and Mint Macaron. The embellishments are simple pieces of twine tied around the bunched stems of the leaves. The focal point of the card is a beautiful piece of the DSP that just stands on its own as far as a design. Don’t you think it’s gorgeous! The DSP is framed with a piece of Mango Melody cardstock. The final accent on the focal point is “be strong, be happy, be you”. 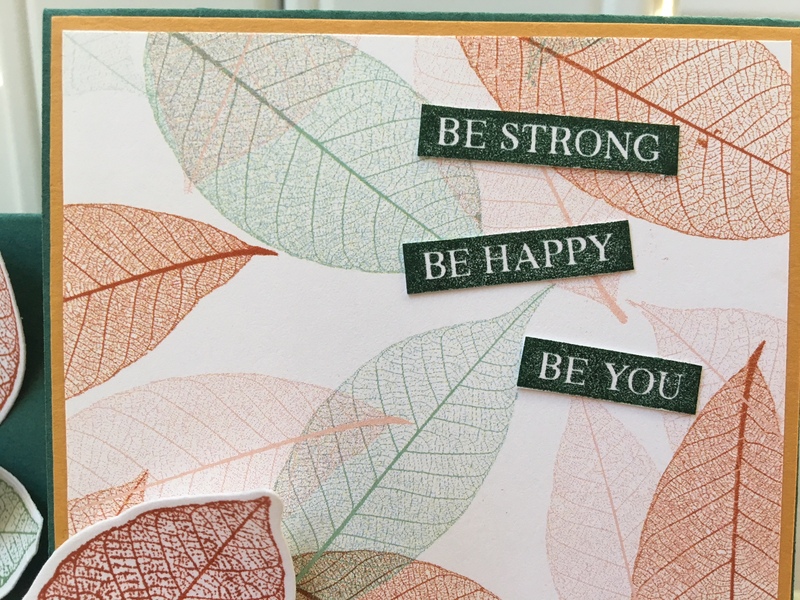 The three pieces are one stamp from the stamp set which was stamped onto Whisper White cardstock with Tranquil Tide ink. The words were then cut apart and randomly glued to the card. 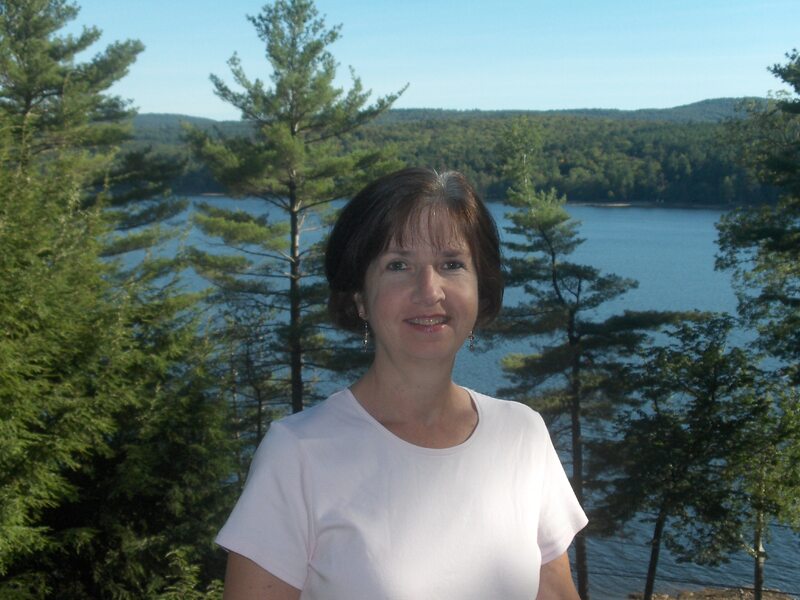 Please be sure to continue the blog hop and stop over at Laura’s project. She has a great design to share with you. All the participants in this month’s Stamp ‘N Hop blog hop are listed below. Also pictured below are the main products that I used to make my project. If you click on any picture, you’ll go directly to my on-line store.